Karl Franz has done it again! The owner of 67 Orange, a speakeasy in Harlem, has opened his second restaurant. Soloman & Kuff Rum Hall, formerly a meatpacking factory, was transformed into a 5,000 square foot industrial space featuring a loft-style dining area along with lounge seating, two elevated wooden DJ booths and two extra-long full bars stocked with over 100 international rums, artisanal cocktails and craft beers. The food menu offers delectable bites that bring you a bit of that West Indian and Caribbean flavor. Executive chef Christopher Faulkner (Melba’s, Colors) creates pan-Caribbean dishes like slow-stewed peppered goat pies, fish and yucca chips, and a selection of coco-bread rolls and stuffed with a choice of fillings ranging from lobster and sausage to ackee and salt fish. 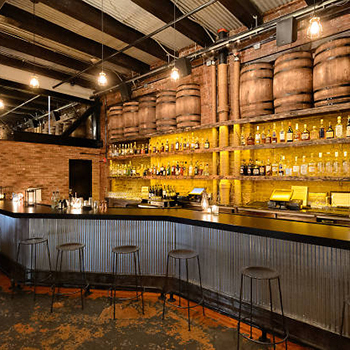 Soloman & Kuff Rum Hall, now being called Harlem’s finest speakeasy, is a place you definitely want to go to!